Paul Kirk is The Dude. Abide. Paul Kirk, one of the Northwest’s most influential mid-century architects, knew what he was doing in those post-war years. He was laying the groundwork for Northwest architecture that is still admired and applied to this day (thankfully). 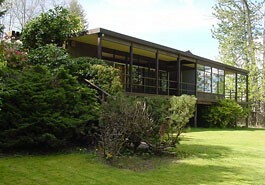 A graduate of the University of Washington’s School of Architecture in 1937, he is responsible for numerous homes and buildings around the Seattle area, including the Magnolia Branch of the Seattle Public Library, University Unitarian Church, Meany Hall on the University of Washington campus, and many homes in Seattle and Eastside neighborhoods. Kirk was at the forefront of the modern movement, combining minimalist design with maximum function. Flat roofs and bands of windows were his style of choice here in the Pacific Northwest. 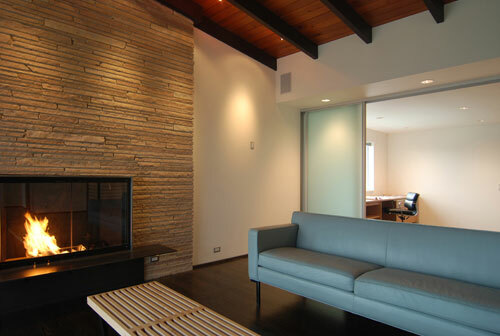 With limited sunlight during the winter months, many mid-century architects adapted this style to allow as much natural light in as possible. Simple cubic shapes and exposed wood framing, central to most of Kirk’s designs, are “back in style”…which is sad to say, because they should never have gone out of fashion. 1. Modestly nestling the home into the site rather than building “on top of” the ground feels better. 3. Good design creates a progression between privacy and transparency. 4. Connecting the inside to the outside creates harmony with the site. 5. Old school passive design is highly sustainable. 6. Small, efficient bedrooms are perfectly pleasant. 7. Outdoor rooms are just as important as indoor rooms. 8. Screen walls offer privacy without cordoning off the interiors. 9. Let nature do the work. 10. Quality of light is more important than the light fixture. Curious? Want more details? Head over to BUILDblog for their take on these 10 lessons. Ashkenazy, B., et. al. “Modern Views: A Conversation on Northwest Modern Architecture,” 43 min. Studio/216 and University of Washington Department of Architecture, http://www.seattlechannel.org/videos/video.asp?ID=9001103. BUILD, “10 Forgotten Lessons of Mid-Century Modern Design,” http://blog.buildllc.com/2011/09/10-forgotten-lessons-of-mid-century-modern-design/ (accessed March 6, 2012). Docomomo-WEWA, “Kirk, Paul Hayden (1914-1995),” http://www.docomomo-wewa.org/architects_detail.php?id=48 (accessed March 6, 2012). This entry was posted in mid-century design, mid-century homes and tagged 1950s, 1960s, 60s, architecture, mid-century, mid-century architects, mid-century homes, mid-century modern, paul kirk, seattle, seattle metro area. Bookmark the permalink. Love the #1 principle – seems like a concept that is only used where there is a lot of land. In the ‘burbs where I am, many houses take up the entire lot leaving houses cheek by jowl and severely lacking in greenscaping.